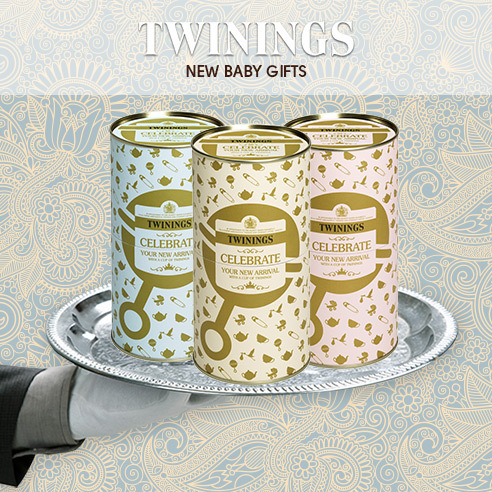 TEA STREET Blog: Twinings Celebrate Royal Baby Boy! Are you busy celebrating the new little Prince? Or perhaps you know someone who have had their own bundle of joy? Well, Twinings are celebrating the birth of the new Prince by giving you a 10% discount and free delivery on their Baby Celebration Tea, so you can join in all the fun! The pink baby girl caddy has loose leaf Peppermint tea in it, the blue baby boy has loose China Yunnan tea in it and the neutral caddy has loose China white tea! It's £36.50 for the gift set before discount, or you can buy either one individually at £10.00 before discount! Discount and free delivery ends on 8/8/13, just add the CODE AFRB0713 at the checkout!